Which Popular 1980s Children’s Toy Started Off As A Greeting Card Character? Researchers Found Cows Produce More Milk When Exposed To What? It’s not uncommon for characters to make the jump from popular children’s shows or movies onto the shelves of local toy stores, yet that’s not what happened with the wildly popular 1980s-era toy Strawberry Shortcake. The red-haired and rosy-cheeked girl and her pink sidekick cat didn’t make their first appearance in a cartoon, children’s movie, or other typical vehicle of entry into the hearts of children (and the wallets of their parents). The character first appeared on greeting cards in the juvenile and humorous card department at the American Greetings card company. The character proved popular enough with children that the company licensed the character and her likeness for use in toy production, cartoons, clothing, and even a video game. 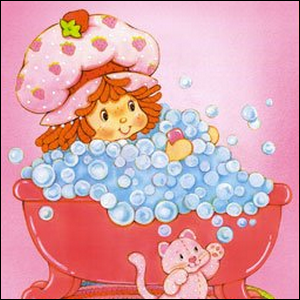 While the novelty of a greeting card drawing becoming a popular children’s toy is, interesting enough, what surprised us the most in plumbing the annals of history to research this bit of trivia was the discovery that Strawberry Shortcake had over thirty food-themed friends. They really went all out with the theme and populating the Shortcake universe; her friends included Huckleberry Pie, Blueberry Muffin, and Raspberry Tart, among others. Who would have guessed that a cute picture of a strawberry-themed kid would spawn a brief empire of fruit and food based merchandising madness?